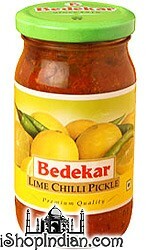 Bedekar Lime Chilli Pickle is made from Spotless Yellow Lime & Green Chillies. It is cured by traditional methods along with Spices & Oil. 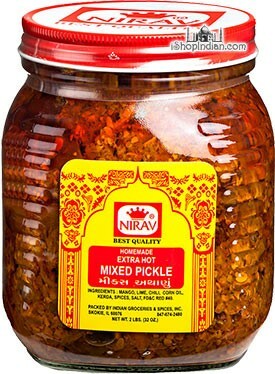 It gives truly traditional taste & great flavor to the pickle. 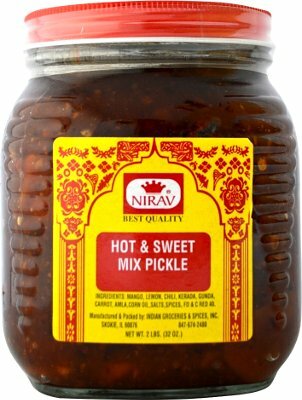 This spicy pickle is made with a combination of chopped mangoes, lime, green chilli, karonda, ginger, oil, salt, ground chilli, mustard, fenugreek, turmeric and compounded asafoetida. 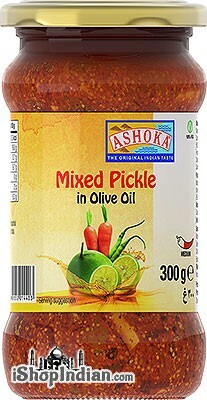 A variety of carefully selected fruits and vegetables from across India are mixed in this exotic Indian pickle. Melting into a distinct flavor that people across India have come to love for generations. 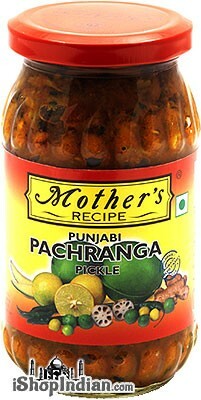 Authentic spiced South Indian pickle made with lime, carrot, bitter gourd, green chili, mango ginger, salt, red chili, mustard, asafoetida, turmeric powder and acetic acid. 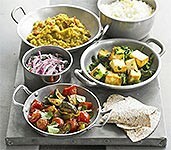 Enjoy with Indian meals as a side accompaniment. 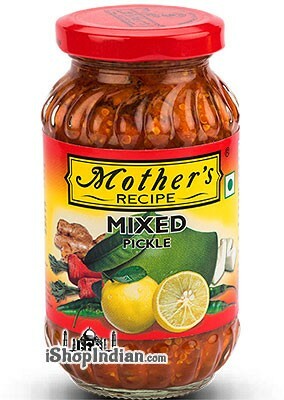 This pungent, chunky pickle contains chopped green mangoes, limes and chillies in a hot and spicy mixture of spices. Preserved in corn oil. 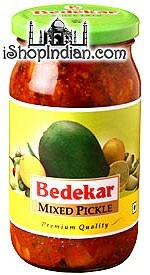 A popular mixed pickle from the Northern regions of India. 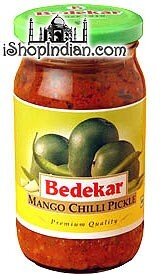 It contains large pieces of mango, lemon, chili and other vegetables, mixed with piquant spices. 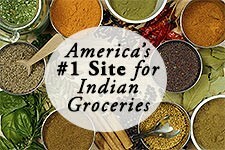 It is also commonly found in Indian restaurants. Ingredients: gongura leaves, red chilies, refined rice bran oil, iodized salt, garlic, coriander powder, fenugreek powder, mustard seeds, chiliies and turmeric powder. An excellent combination of pickled diced gongura leaves, red chilies, refined rice bran oil, iodized salt, coriander powder, fenugreek powder, mustard seeds, chillies, asafoetida and turmeric powder. Sour and spicy pickle made with lime pieces, ginger, salt, lime juice, chilli powder, fenugreek powder, citric acid (lemon powder) and turmeric powder. 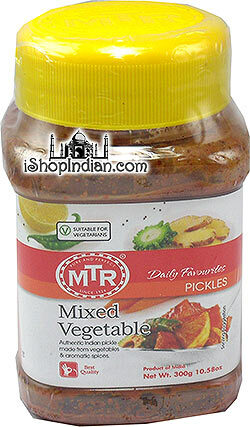 Tasty and spicy pickle made with mango ginger, refined rice bran oil, iodized salt, jaggery, garlic, chili powder, fenugreek powder, mustard seeds, chilies, acidity regular and turmeric powder. Pickled sliced mixed vegetables in oil with garlic. Ingredients: mango, carrot, refined rice bran oil, green chili, green tomato, lime, iodized salt, ginger, garlic, chili powder, mustard powder, acetic acid, citric acid, fenugreek powder and turmeric powder.